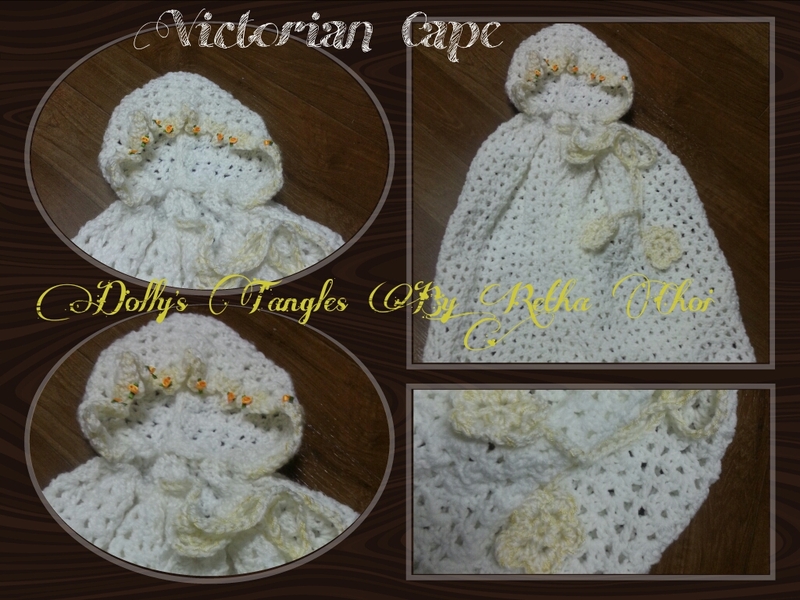 Dolly's Tangles | The joys of crochet. Mostly my work..designs and patterns. The joys of crochet. Mostly my work..designs and patterns. I had some motivation and creative juices running today. I am so enjoying just making something up as I go. Nothing like having a picture in your mind and the idea coming to fruition. A black and white petunia necklace, made with cotton yarn. The yarn was so pretty as it came to my hook. I so like varigated yarns. They make things look interesting and pretty. I am very pleased with my creation. It would definitly go well with a little black dress. I am thinking of making earrings to match. A black and white petunia would be beautiful in reality. After my little baby cape, I wanted to make a little girls cape. So I found a pattern on Red Heart. It was simple and easy. I am hoping the little friend I made it for will enjoy it. I remember when I was young I had special clothes that made me feel special. Especially, for dressing up for church. Dressing up for church was a highlight of my week. Nothing like feeling you look pretty. 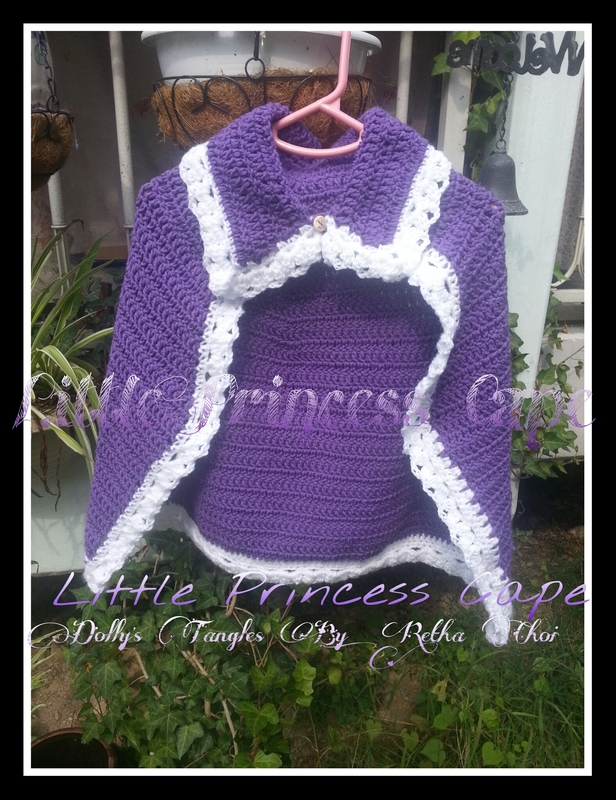 Well, this is a beautiful little cape for a little Princess! I recently made this baby cape. I think it turned out rather well. In my church we dedicate our children to God publicly. It is a wonderful blessing…My children never had that chance until recently. I didnt prepare special things for them, because they arent babies. My friends wife is a great organizer for special things in her girls’ lives. I get jealous of women who plan parties and go all out for their kids. My poor children havent had a mother like that. But dedicating them to God is an awesome responsibility to all parents. I so dream of how I want my children to grow and the kind of men I wish them to be. It is sometimes overwhelming to raise children in the right path. 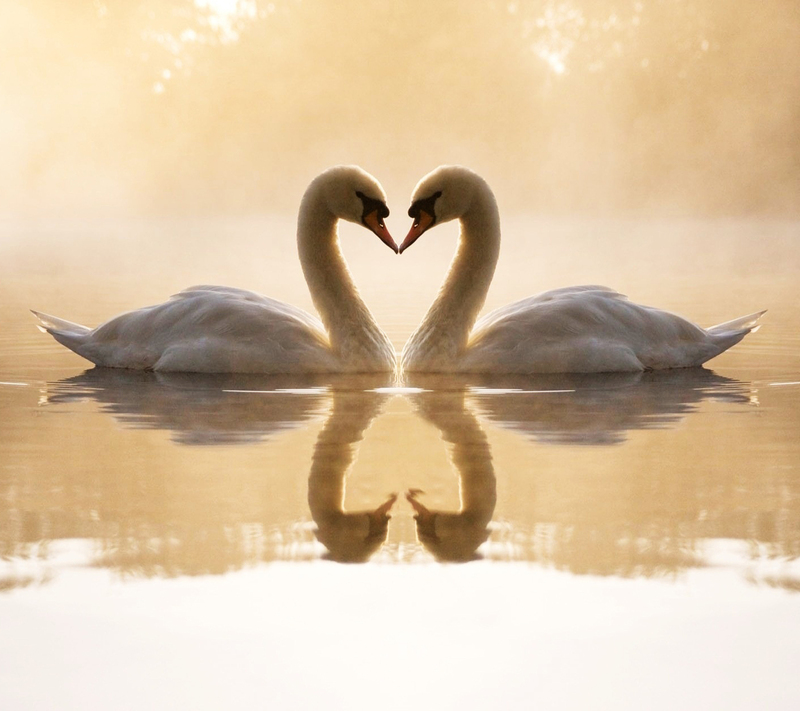 Only God can make sure it is the best one. I see glimpses of what my boys will be like, I just hope all my prayers and wishes come true for them! I don’t know why slippers speak to me. For one, they are easy to make and can easily be changed and designed in many different ways. Slippers make me think of cold winter nights when I was young. We lived in old farm houses that were often fueled either by wood or coal. We had to bundle up and wear warm clothes, from head to toe. Slippers can be pretty,cute and warm. They serve a necessary purpose and are reminders of my childhood. I am happy when I make them. At the moment it has been so hot here in Korea. I did finish a charity gift for a charity for families that have lost babies and children. It is called Precious Angels Society. They are on facebook. I made a little Cocoon and some slippers. Why did I choose this one? I lost my little girl 14 years ago. My first baby. This month of July is a hard month. I have these strange feelings and cry often. I do have two handsome and beautiful boys…but nothing will ever erase the memories and dreams I had for my little Hannah Dawn…she would have been loved beyond measure. I know for many people they may say they understand, but it is something that only those who go through it understand. I want to share with a mother and father a little something that will wrap and hold their precious little one close until they can meet again. It is never easy, but I pray that the family that receive my gift will be able to wrap their precious angel and know someone truely understands. My experience here in Korea was a bit of a horror for me. I was never allowed to see or hold her, but for a glance. Then they coldly put her on a cold cart amongst the bloody clothes. Those were her wraps. Then my husband had to sign for her cremation. I slept in a hot enclosed room on a hard bed with my husband on a hard cot beside me on the floor. I had nightmares and woke up crying. I had those nightmares for two years. When my sons came along especially my eldest..I was a mess of anxiety and tears. I went to the doctor for every little thing. Because I told my husband the doctors had to listen and care. Now I know I passed many of those things onto my son. But I had no support system per-say here in Korea. There are many sad families in this world. Perhaps my small donation will make a difference in their lives and give them a sense of peace, even if they can’t feel it in the moment or even many years from that moment. Logo drawn by my 12 year old son. Awesome bowl made by a friend.